Welcome to the first installment of the Knowledge-Driven Podcast. In this new series, Software Systems Engineer Cameron Boozarjomehri interviews technical leaders at MITRE who have made knowledge sharing and collaboration an integral part of their practice. Before moving into his current role as the Innovation Area Lead for Agile Connected Government here at MITRE, Sanith Wijesinghe followed a long and varied path, which he describes as a random walk. Starting in aerospace engineering with a doctoral degree in Aerospace and Astronautics from the Massachusetts Institute of Technology, Sanith moved to Wall Street, where he worked on trading systems, acquiring skills that would serve him well when he opted to come to MITRE to develop fraud prevention technologies. His random walk eventually led to his responsibility for managing more than 25 projects each fiscal year, all focused on helping civilian government agencies and the Department of Defense work more efficiently on behalf of the residents of our country and our allies. I had the opportunity to sit with him and learn more about Agile Connected Government’s mission, how it supports MITRE’s sponsors, and how programs like his enable all members of MITRE’s staff to propose and pursue interesting research with tangible impacts on how our government operates. Cameron B.: 00:00 Hi, my name is Cameron Boozarjomehri, and I would like to welcome you to MITRE’s Knowledge Driven podcast. 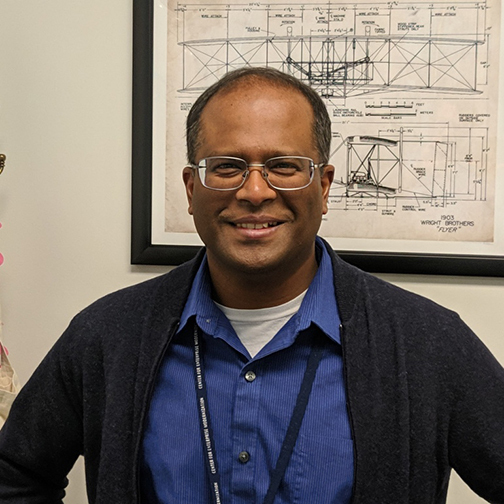 Today, I interview Sanith Wijesinghe about his role within Agile Connected Government. Sanith W.: 00:13 Thanks for having me. So my background is a bit of a random walk. My training is in aerospace engineering, and right after that, I worked on Wall Street for a couple of years, building training systems, and the last seven years, I’ve been at MITRE, building algorithms to detect fraud and help lead our innovation efforts, so that’s kind of a quick snapshot of my background. Cameron B.: 00:40 If you don’t mind me asking, what drew you to MITRE? Sanith W.: 00:44 I was really interested in the public service mission at MITRE, and I always wanted to get back into research after being in the industry for a couple of years, and was struggling to figure out how do you bring those two kind of things together again? MITRE was one of those places that had a very unique fit. You could work in research. You could still work in public interest mission, and I found it to be a very compelling place to be. Cameron B.: 01:11 Since you are the IAL for Agile Connected Government, I was hoping that you could tell us a little more about that innovation area and the kind of things you focus on. Sanith W.: 01:19 Sure. So, Agile Connected Government is probably one of the newest innovation areas at MITRE. The big picture for ACG is about driving efficiency and efficacy of our government operations, so that’s kind of a very big-picture, kind of high-level mission. Efficiency here is a lot to do with the internal staffing and resources that our agencies incur when they deliver a particular service. The efficacy here refers to the end stakeholders, and how they benefit, how long it takes for them to conduct a transaction, how quick is it to answer a question, how fast can they get benefits. So, both of these things should go hand in hand, efficiency and efficacy, but sometimes, they don’t. So our research is all about trying to make sure we can get both of those things improved, and provide value to our sponsors. Cameron B.: 02:18 So, kind of going to that point, what does success look like for research proposals and projects inside of ACG? So, we’ve divided up our research into three major themes. The first is around improving customer services, which is a big need for our sponsors. They are struggling to kind of meet the same standards that you would expect from a private industry, kind of customer service interaction. The second area is about improving the acquisition process, which again, is one of those things which take a long time to get through, and really is not very agile right now. It doesn’t respond well to emerging threats as agile as we would like it to be. The third area is an area which kind of spans many different sponsors, in that we’re trying to help them streamline the implementation of new regulations and laws. So, our agencies kind of fit in this space where they’re both the implementer of rules and regulations that are passed in the House or in the Congress, but then they also set regulations for folks downstream, who need to comply against their agency programs. So, having line of sight between all of those moving parts, and having transparency, and making sure those rules get effectively implemented is a big challenge. So, the research we run essentially aligns to one of those three areas, and we are looking at both the technology layer here, in terms of what are some new tools and applications we can provide, but also span some of the more social, behavioral elements of it as well. You can’t just throw technology at a problem. There’s all these organizational elements that need to also come together. So we are looking at more of an integrated view, in terms of how we can best push the needle along, and sometimes it’s not a technology problem, it’s an organizational issue. We also try to take a slightly wider lens beyond just kind of how the problem is stated, to include things that might be indirect effects or interdependencies that might come from other interactions beyond just kind of the immediate view of the sponsor agencies. So, it’s this holistic kind of systems engineering view that sets some of the context for our projects. Cameron B.: 04:51 Maybe without directly calling out one of your sponsors, what is kind of the size or scope of the projects that you typically see come within your innovation area? Sanith W.: 05:01 We are really trying to go after really challenging, deep-rooted problems that they may have had for years, that they struggle to find any traction on. There’s no limit on kind of what the scale of that size of the problem might be. You know, we are working to help with implementation of the new tax bill, looking at some of the dependencies and changes that has introduced, so that’s at the very large scale, but also, we’re looking at things where, for example, small changes might give disproportionately large benefits. So on the social behavioral side, we’re investigating how we might provide incentives within organization, to change their mindsets, to adopt new technologies or to start different new practices. So there’s a whole continuum and a span of things that we can get involved with. Ultimately, it’s each of the project teams’ researchers to kind of break out that, in terms of what’s the scope they want to address within the timeframe they have, and where could they best provide value and guidance with the funding they have available. Cameron B.: 06:11 Where do you see this kind of research going forward into the future? Is there a direction you’re hoping to see it go? Are new technologies coming out that you’re really hoping to see us engage with, to help sponsors, things like that? Yeah, so, you know, each of the major research areas have examples like this. The coming years, I’d say on the acquisition front, we’ve had success this year, kind of collating all the data that identifies different parts of the acquisition process, from characteristics of vendors, the contracts they bid on, the awards that they got. So we have, in that domain, a baseline of data. The next coming year, we are looking at taking advantage of it to build predictive analytics, try to do a bit more forecasting of what kind of contracts work best for what kinds of services, and with what kinds of vendors, so you can start to build a bit more of this kind of proactive decision-making in the acquisition process. On the customer services side, we have started to prototype voice agents. This is a new customer service channel that’s emerging, where instead of typing of chat boxes, you now can just directly ask question and answers from your sponsors and get answers back. We are hoping to grow those services out further and demonstrate how agencies can take advantage of these systems, which right now aren’t quite at the level of being able to answer kind of complex questions. You can basically ask what the weather’s like or what time your flight’s arriving, but nothing at the scale of, “Am I eligible for a particular kind of benefit?” which is a lot more of a nuanced question. So, excited about trying to deploy that kind of capability with our sponsors. And going back to our regulations side, as I said, we have now this baseline of what’s connected to what, and the next level is about potentially automating the execution of those policies, using smart contracts and other kind of new technologies. Cameron B.: 08:28 Can you talk about the MITRE innovation program itself, and kind of how it’s helping MITRE meet the mission of its sponsors, or kind of building the need before we even need to find the sponsor? Sanith W.: 08:40 Sure, so MITRE’s Innovation Program is an independent innovation program that runs separate from all the direct work that MITRE does for our sponsors, and it’s really positioned to kind of investigate the far field of our sponsors’ mission spaces, things that haven’t quite got close enough to be an operational kind of need, but things that we feel are areas that our sponsors would certainly be heading towards, but we provide that upfront guidance on identifying what that landscape is going to look like, what are the opportunities, risks, and so on. And through an experimental approach, we’re able to provide that guidance upstream, so that our sponsors can make appropriate decisions when the time comes. Cameron B.: 09:34 So you could say the benefits to the MITRE Innovation Program are twofold. One is that you’re encouraging research and just general question-asking from the internal staff, and then you are also, in a way, being proactive to sponsors, where you’re giving them the opportunity to explore questions they might not even think to ask yet. Sanith W.: 09:54 Exactly, and you know, when you start a research project, it can go in many different ways, so we encourage early experimentation. You know, try something out. If it fails, it doesn’t really fail. It’s a learning kind of data point, which you can use to inform the next round. So in that sense, we want to create an environment where that is the norm, that you don’t have to kind of wait to get all the requirements in before you actually take the next step. So, I think over time, the engagement with our sponsors allows us to kind of iterate with them as well, so they get to see early kind of insights that might spark new questions, that could then inform the next round of analysis. Cameron B.: 10:46 In closing, if you were talking to someone just off the streets, and explain kind of MITRE in a nutshell, and why they should want to bring an opportunity for research or interaction to MITRE, what would you tell them? Sanith W.: 11:01 What I would say is MITRE is a not-for-profit. We work solely in the public interest, so our research is really objective. It’s not meant to serve any particular viewpoint or another. It’s driven just by science, and if you’re looking for an answer, evaluation of a scenario, that can give you true objective findings at the end of the day, then MITRE’s a place to come. Cameron B. 11:44 … best of luck on your future Agile Connected Government projects. Sanith W.: 11:47 Thank you.